This past Monday, I attended a media tasting at Puyero Veneuzelan Flavor, South Street's latest addition. I was excited to see what was being offered, considering there are few options for Venezuelan food in Philly, with the exception of a food truck here and there. The brainchild of brothers Simon & Gil Arends and Manuela Villasmil, Puyero specializes in Venezuelan street food, with a focus on arepas - crunchy ground maize patties ready to be filled with a variety of proteins, cheese, plantains, and doused in delicious sauces. We started off with two of their sides. 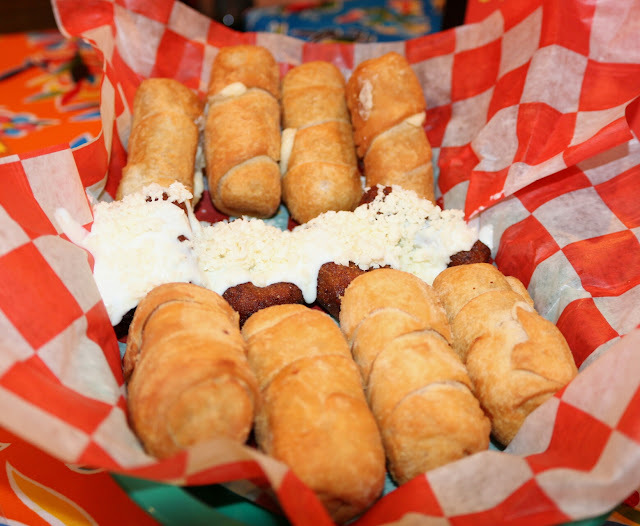 Tequenos are deep-fried fritters of dough, filled with gooey cheese. Enjoyably salty and crisp, these are perfect to dip into their delectable sauces, which include sweet and spicy mango, spicy mayo, and an herbaceous verde. The mandoca was a mix of corn flour and plantains, with a crisp texture on the exterior that lent itself to a light creaminess within. Deep fried with cinnamon, there was a sweetness that was balanced by cream and salty white cheese. Delicious! The arepas were well-constructed and we were able to try some mini versions of what will be offered. The de calle offered up a fried corn patty filled with roasted pork shoulder, green cabage, cheese, with a mix of ketchup and green mayo. The pabellon was my favorite, filled with shredded beef, black beans, a fried sweet plantain, and cheese, all within a soft baked corn patty. Puyero will also be offering up patacones, which are deep fried plantains sandwiching a veritable melange of chicken, beef, ham, white cheese, gouda, cabbage, ketchup, mustard, and green mayo. 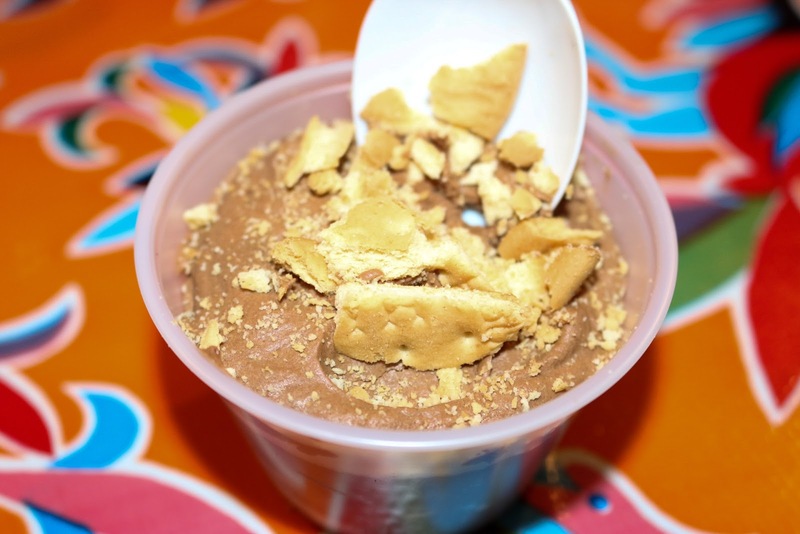 Perfect for those late nights on South Street! They've currently got two sweet options on the menu as well. You'll be able to enjoy churros filled with chocolate as well as the marquesa, butter cookies immersed in chocolate mousse. 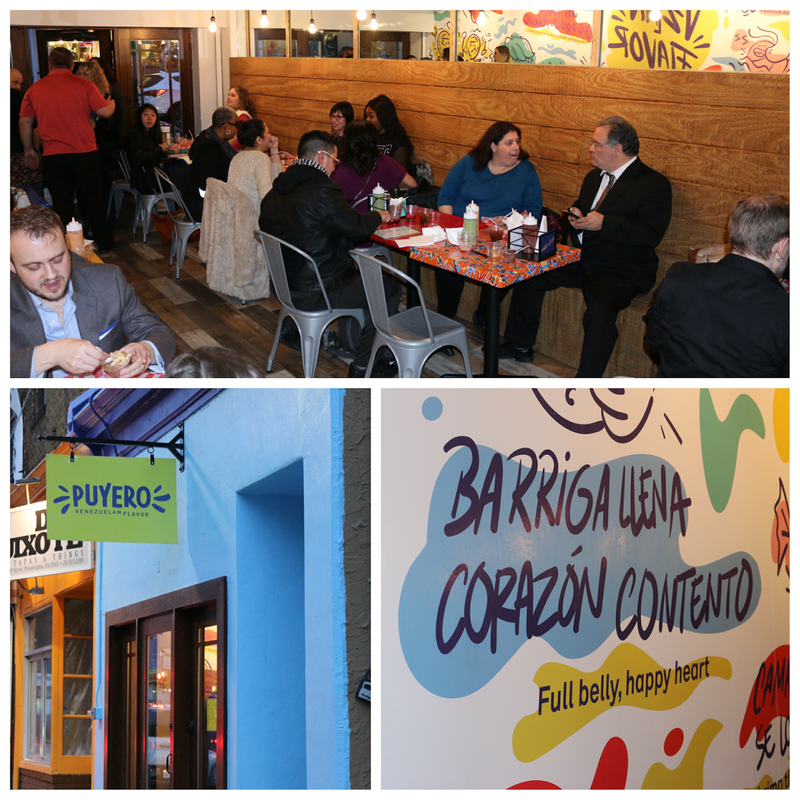 Puyero's sure to be a hit for those roaming South Street. 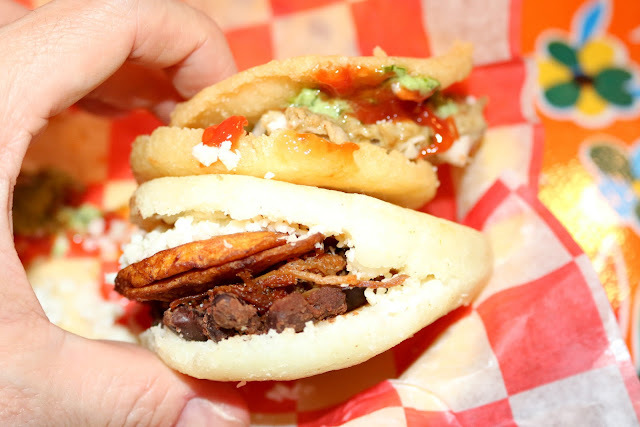 Their arepas are the perfect to-go snack, but be sure to pop on in and stay awhile so you can enjoy the vibrant and colorful atmosphere. This Saturday, they'll be offering a free side with any arepa or patacon and on Sunday, who can say no to free churros? !